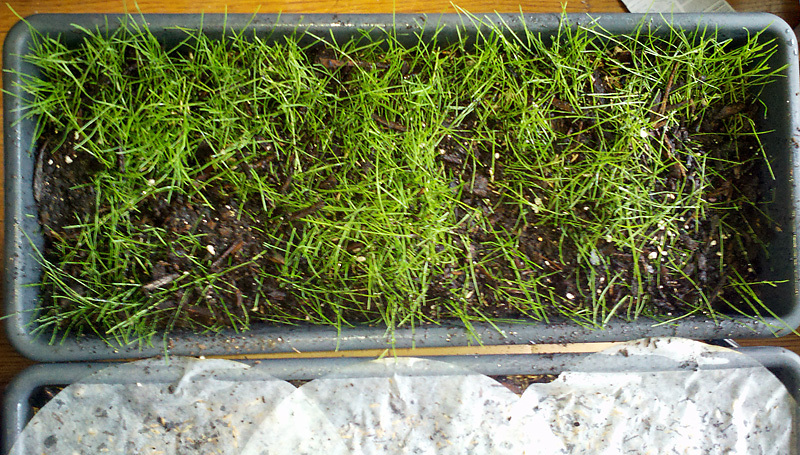 It's day 17 of my project to grow grass indoors and it's been coming along nicely but not great. There were two main issues that were bugging me. First, the level of the potting mix had fallen quite a bit after watering it a few days and I had wished that I added more potting mix to start out with. When I started my Jonathan Green Black Beauty experiment I made sure I had enough potting mix. Second, while about 70% of the area had filled in nicely the other sections were very thin. This is most likely due my use of grass seed that about 3 years old. I tried using more grass seed to compensate but still got spotty results. Grass was still germinating, not all the varieties germinate at the same time, and those areas did have some new grass sprouting but I decided to ramp things up. First I started by topdressing with about 1/4" of additional organic potting mix. I used my fingers to rake the potting mix down. Then I added some more grass seed, concentrating mostly on the thin areas and topped it with about another 1/4" of organic potting mix. Finally I watered it in but I've made some changes to my watering. Instead of using water straight out of the tap and letting it warm up to room temperature I filled my spray bottle with filtered water from a Brita pitcher to cut down on the chlorine. Instead of using plain water I mixed in some Organica Plant Growth Activator Plus which contains a number of different beneficial soil bacteria and fungi as well as humic acid, seaweed extract, and some hydrolized soy meal. The application of PGA+ was the reason I chose filtered water since the chlorine in my tap water kills the bacteria and fungi but I'm going to continue to use filtered water from now. Can't imagine the chlorine is good for the plants either. The grass doesn't look as full as it did this morning because as careful as I tried to be, the top dressing did bury some of the blades of grass. It's hard to tell in the photo because the color doesn't come through great in the photo but the color of the grass is starting to darken as well.